As all rugby professional teams are preparing for their 2014 programmes, the Eye of the Tiger Rugby academy is also preparing their boys to step up their development programme for 2014. 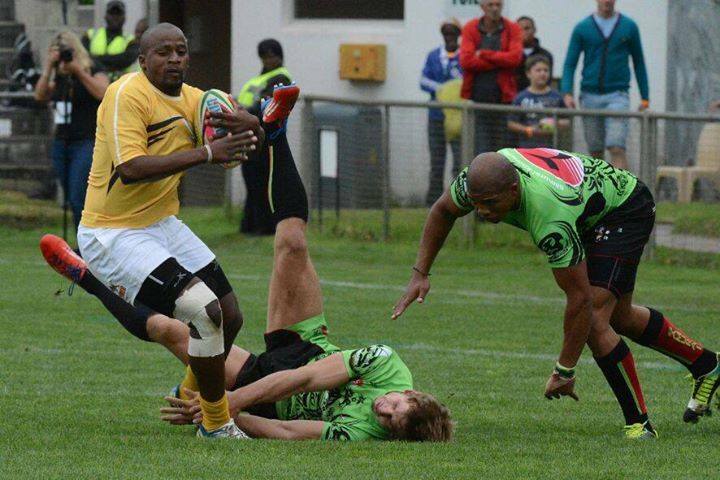 In their test of the times, the Eye Of the Tiger Rugby Academy, the 2013 Lion’s Soweto Rugby Tournament champions and 2013 Klerksdorp Sevens Finalists tested their mantle at the George Sevens at Outeniqua Park Rugby Stadium on the 11&12 January 2014. The second day became a different day altogether for the Eye of the Tiger, against their opponents the Cheetahs, they were not only bullish against the Cheetahs but very smart and sophisticated in the articulation of their moves during the game resulting in a 24:19 win. When the game was over it was like nothing happened and they were ready for the Inter Provincial Sevens Champions the Leopards. This was the game that really shown the academy boys talent and skill and truly separated them from their previous days stage fright. They had all the determination and confidence on all fronts, the young Sima Yafele captured the audience with his dances and mind work in the field whilst Francois Fourie played the Frankie Horne of the team. Niel Meyer our speedster was eager to take it to the line. The speedster runs like his feet do not touch the ground. You could feel the warmth of the audience towards the youngsters that all is forgotten about yesterday and everyone appreciates their hard work. The Leopards the Inter Provincial Sevens Champions for 2013 had a real run from the academy boys giving neck to neck scores whilst Eye of the Tiger was leading during the first half. It was clear that the game was not in anyone’s pocket. The Leopards got away with a real narrow escape at the final whistle with 14:17 win. I would also like to congratulate the Champions the Emerging Springboks for the sportsmanship, discipline and character they have shown throughout the Tournament, I take pride in them and wish them well in their future endeavours in rugby said Ms Viwe Qegu. The Eye of the Tiger is truly grateful to this opportunity, and humbled at our acceptance to the competition, we would like to treat this opportunity with warm hands and great appreciation. We are willing to go back to the drawing board to strengthen the boys on several areas that will make them compete with ease at the highest level in order to stamp our commitment to development and skilling of young talent in the country. The players of the Eye of the Tiger come to the Eye of the Tiger to fulfil dreams and I believe that this is one way of unfolding those dreams for these young men, believes Ms Viwe Qegu.